I wonder if people who were alive when Galileo first turned his telescope to the heavens in 1610, when he discovered the moons of Jupiter, realized that it was a seminal moment in human history. The discovery changed everything. It showed that not all celestial objects orbit the Earth and set the stage for adoption of the Copernican theory, which holds, of course, that the Earth orbits the sun and not the other way around. From that date onward, telescopes aimed at the sky became a staple of cosmology and a constant source of discovery and wonder for humanity. It’s quite possible that people living in the distant future will view last year’s announcement of the discovery of gravitational waves as a similar turning point in humanity’s ability to observe and understand the cosmos. Gravitational waves are ripples in the fabric of space that propagate outward at the speed of light whenever a massive body accelerates. Albert Einstein predicted their existence in 1916, following his groundbreaking development of general relativity (although 20 years later he briefly recanted his claim before being corrected by a referee of a paper he intended to submit announcing his change of view). While all massive objects emit gravitational waves when their motion shifts, gravity itself is so weak that the tiny waves generated by human-sized objects are likely never to be detectable. To produce a gravitational wave signal that might be detected on Earth, a cataclysmic event associated with an enormous object would be required. If a wave from such an event were to pass through the room in which I am writing this article, the length of the room would oscillate. The room’s width would also oscillate, but exactly out of phase with the oscillations in the room’s length. When one length gets shorter, the other gets longer. It was proposed almost 50 years ago that if scientists could build a sufficiently large detector with two perpendicular arms, and if they could carefully monitor minute changes in the length of each arm, it might be possible to detect gravitational waves coming from cataclysmic astrophysical events in our galaxy or neighboring galaxies. Perhaps the biggest such cataclysms would be the collision of giant black holes. These events, though rare, are predicted to occur perhaps a few times each year throughout perhaps a billion galaxies. But here’s the rub: To detect gravitational waves created by such distant events, observers would need the ability to measure a change in length between the two perpendicular arms by an amount equal to one-thousandth the diameter of a single proton! Few science fiction writers have the temerity to suggest it's possible to build detectors that could make such a measurement. As a theorist, I was highly skeptical it could be done. First off, the quantum mechanical vibrations of the surface of each mirror are in general much greater than this magnitude. Second, the vibrations produced by a truck hitting a pothole even miles away from the apparatus would trigger a bigger signal. Despite these incredible challenges, a brave group of experimenters worked for four decades to build LIGO, or Laser Interferometer Gravitational-wave Observatory. One set of LIGO arms — two four-kilometer-long vacuum-sealed tunnels, each with a mirror at both ends — was built in Hanford, Washington. An identical one was built in Livingston, Louisiana. Laser beams bounce back and forth between the mirrors in each tunnel, and by measuring the respective time of flight of these beams, it’s possible to detect small changes in the length of each tunnel. Or so the researchers hoped. Once the tunnels were completed, the researchers carefully calibrated each detector, making sure their apparatus would filter out extraneous noise events (including earthquakes, those pothole-hitting trucks, and other ground vibrations). Further, by considering only identical signals observed in each detector, with an 8-millisecond time difference between them (the time it would take a gravitational wave to travel between Washington and Louisiana), all other extraneous sources of noise at each location could be filtered out. The desired level of accuracy and sensitivity was achieved on September 14, 2015. 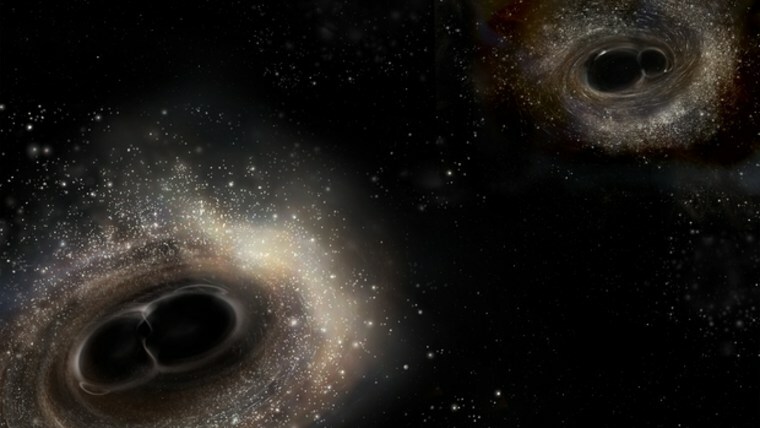 Then, during an engineering test run that same day, LIGO detected precisely the kind of gravitational wave signal that would occur if two black holes, one 36 times the mass of the sun, and one 29 times the mass of the sun, collided in a galaxy 1.3 billion light-years away. The energy contained within the gravitational waves liberated by that collision — which lasted a mere 0.2 seconds — was greater than the light energy unleashed during the same period by all the stars in the visible universe. The September 14 discovery was reported to the world on February 11, 2016. That day will forever mark the moment we opened a new window on the universe. Because gravitational waves are emitted from objects like colliding black holes, which otherwise are largely unobservable, we can use them to probe parts of the universe that until now have been inaccessible to us. We can learn about the formation of black holes and, in turn, the formation of the galaxies that contain them. And whenever we open a new window on the universe, we’re often surprised. So who knows what’s in store? We might even be able to observe gravitational waves from the Big Bang itself. The universe was so hot and dense in the earliest moments of the Big Bang that no light could have propagated unimpeded from that time until the present. But since they interact so weakly with matter, pristine gravitational waves might still be traveling in space from a time when the universe was a billionth of a billionth of a billionth of a billionth of a second old. If we can detect them, these waves might give us information about the Big Bang and about the existence of other universes. To detect gravitational waves from the Big Bang, we’ll probably need to put supersized versions of LIGO in space, with mirror separations not in kilometers, like at LIGO, but in millions of kilometers. This might sound like science fiction today, but LIGO sounded that way in the 1970’s when it was first proposed. You might say that if we put a fleet of gravitational wave detectors in space, the sky’s the limit. Or maybe it would be more accurate to say there are no foreseeable limits — and no end of surprises — to what might be revealed about the universe in which we were privileged to evolve consciousness, science, and technology.